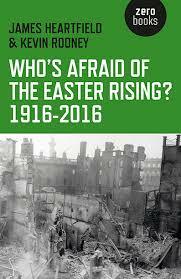 Book review: Who’s afraid of the Easter Rising? James Heartfield & Kevin Rooney (2015), Who’s Afraid of the Easter Rising ? 1916-2016, Winchester: Zero Books, 160pp. Reviewed by Liam Ó Ruairc. James Heartfield and Kevin Rooney have produced an interesting, valuable and timely short book on the 1916 Easter Rising and how it has been commemorated since 1966. The authors are clearly sympathetic to the republican insurgents of 1916. They provide a fine account of the Easter Rising and its context, emphasizing that it was a historical event in global terms. They locate the 1916 Rising in the context of inter-imperialist rivalries and labour unrest,and how it resonated from India to Burma, from Lenin to Ho Chi Minh. This is a welcome progressive alternative and counter-narrative to the standard official accounts of the period. But the book is especially valuable for its discussion of the issue of historical memory and its connection to the peace process. Heartfield and Rooney provide an excellent critique of the so-called ‘Decade of Centenaries’, clearly influenced by some of the most creative insights of Frank Furedi (1992) Mythical Past, Elusive Future: An Essay in the Sociology of History. The authors first examine how the Rising has previously been commemorated, and how central taking ownership and control of anniversary commemorations was. Eamon de Valera ‘owned’ the 50th anniversary of the Rising in 1966, celebrating it as the foundation of the 26-Counties state. Liam Cosgrave tried to ban the 60th anniversary in 1976 only succeeding in losing control of it. In 1991 Charles Haughey clamped down on the 75th anniversary choking it. But for the 100th anniversary in 2016 “the Decade of Centenaries has given up on trying to control the event, and chosen instead to decentre it and dilute it, by putting it alongside other events, of supposedly equal significance” (150). The 1916 Easter Rising is being ‘decentred’ and ‘diluted’ by being put on par with the signing of the Ulster Covenant in 1912, the 1913 Dublin lock-out and the battle of the Somme; all the dead should be equally remembered and respected, be they insurgents in Dublin or Irishmen in the British Army -a kind of ‘lowest common denominator’ type of history. This has the effect of downgrading the Easter Rising and its significance. Heartfield and Rooney point out that there are three major flaws with this decentering and dilution of history. Firstly, “The plurality of the Decade of Centenaries, by seeking to build cohesion through recognition of mutual suffering, is robbing events of their meaning. Seen only as suffering bodies, the mean and women who took part in these conflicts are being denied the motives that made them take up arms” (149). Secondly, not only are events robbed of their meaning, but there is the problem of moral equivalence. The Decade of Centenaries being committed ‘to respect all traditions on this island equally’ refuses to make any moral distinction between those who fought in the British Army, the Easter Rising or in the UVF. For the authors, “to suspend critical judgement on the rights and wrongs of this historical period is to lose oneself in non-judgementalism and relativism” (5). Thirdly, the Easter Rising and other historical events are being used to promote ‘peace and reconciliation’, ‘promoting respect and mutual understanding’ – “in other words, we have the discipline of history being manipulated to suit a contemporary political imperative. In short, history is to be bastardised when it suits, in order to underpin the politics of the peace process… It contrives an ahistorical, manipulated and retrospective consensus about the legacy of 1916 and other events in order to bolster, in the crudest of ways, the contemporary peace process. It is worth remembering the words of historian Roy Foster when he said ‘for all the well-meaning government rhetoric about ‘our shared history’, revolutions are about antagonism, not reconciliation'” (5-6). The fundamental flaw in this ‘shared history’ concept as Brian Hanley has shown elsewhere is this: “That Ireland and Britain share a history is a historical fact but they did not share an equal history: only one was conquered by the other and only one became a global empire. Ultimately, and allowing for all the complexities and nuances that British rule in Ireland involved, in the last resort the Crown depended on force to hold this country. Attempting to commemorate 1916 and avoiding mentioning this lest it give offence will ultimately satisfy nobody (Brian Hanley, Who Fears to Speak of 1916?, History Ireland, March-April 2015, 10). There are, however, a number of points Heartfield and Rooney make that the present reviewer has issues with. One gets the impression that the authors see the Rising as the “founding event of the Irish state” (ie. p. 147). It is, however, a mistake to assume that the 26-County state is a continuation of the Republic that was proclaimed in 1916. The founding act of the 26-County state are two Acts of the Westminster parliament: the Government of Ireland Act 1920 and the Irish Free State Constitution Act 1922, both of them passed in opposition to the Republic proclaimed in 1916. The authors also seriously downplay Connolly’s pro-German stance during the First World War (115-116). Whatever the internationalist propaganda written during the first six months of the war, or the initial slogan of serving neither king nor kaiser, Connolly’s position rapidly moved from a declared stance of neutrality to an intensely partisan, pro-German position. Connolly welcomed German victories because, the weaker Britain became, “the stronger became every revolutionary force”. German victories for Connolly were the victories “of the most enlightened nation in Europe” whose democracy is most feared by the cunning capitalists of the world”. The German working class “had advanced nearest to the capture of the citadel of capitalism” (Irish Worker September 5 1914). Connolly’s opinion did not change later. In Workers’ Republic he published an extraordinary article by an American, Frederick C Howe, which ran two full pages of the paper, praising the virtues of “German state socialism” (February 9 1916). It was this “state socialism” , Connolly claimed in his article, ‘Secrets of Germany’s success – state socialism’, that explained Germany’s advance in the war. In one of the last articles written by Connolly, he argued that the German empire was “a homogeneous empire of self-governing peoples”, which contained “in germ more of the possibilities of freedom and civilisation” than the British (Workers’ Republic March 18 1916). Indeed in the final issue of Workers’ Republic, a week before the Easter Rising, Connolly hailed “the wonderful fight being made by the Germans against odds” and inclined to the conclusion that “the German nation is incomparably superior to any nation in Europe”. It was not Lenin who appealed to Connolly, but rather Lenin’s life-long opponent, the Polish socialist leader, Joseph Pilsudski, who also had allied himself militarily with Germany and Austria and against Russia in order to fight for an independent Poland. Connolly applauded Pilsudski’s Polish Legion for fighting alongside Germany against Russia as a contingent on the Austrian army (see Workers’ Republic April 15 1916). (for more on all this see in particular: Brendan Clifford (1985) James Connolly: The Polish Aspect: A Review of James Connolly’s Political and Spiritual Affinity with Joseph Pilsudski, Leader of the Polish Socialist Party, Organiser of the Polish Legions and Founder of the Polish State, Belfast: Athol Books and Brendan Clifford (2004) Connolly and German Socialism, Belfast: Athol Books.) Some weeks ago SIPTU produced a facsimile edition of the 39 issues of Workers’ Republic which should settle the issue for any reader still in doubt about Connolly’s pro-German stance. There is also something somewhat ‘dated’ about the authors’ critique of historical revisionism in the current Irish context (and their case is not helped by presenting the C.D. Greaves school of falsification and works as dreadful as those of Tim Pat Coogan or P. Berresford Ellis as an alternative!) This is 2016 not 1989. Columnists in the Irish Independent aside, the dominant ideology today is ‘post revisionism’. If revisionism was a tragedy then post-revisionism is a farce. At least Roy Foster was more interesting and thought-provoking than Diarmaid Ferriter.The book would have been better had the authors delved into the ‘post-revisionist’ swamp. Those differences apart, republicans, socialists and other progressives should very much welcome James Heartfield and Kevin Rooney’s relevant intervention in the debates regarding the ‘Decade of Centenaries’. Posted on November 25, 2015, in General revolutionary history, Historiography and historical texts, Irish Citizen Army, Irish politics today, James Connolly, Reviews - books, Revolutionary figures, The road to the Easter Rising. Bookmark the permalink. 3 Comments. I wouldn’t be too bothered about Connolly hoping the Germans won – that is revolutionary defeatism and essentially the same as Lenin. What is wrong, however, is ‘talking up’ the Germans as somehow being good or better imperialists. Connolly may well not have been aware of the German imperialists’ record in their East Africa and South-West African colonies. And the German working class was certainly more advanced than the British working class. Just look at what happened after the First World War. Germany entered a revolutionary period, whereas in Britain, although there was certainly a working class upsurge, the question of revolution was never posed. Wasn’t Brendan Clifford one of the BICO people, and therefore inclined to try to undermine Connolly? Whatever illusions Connolly might have entertained about ‘German state socialism’, he still stands head and shoulders above the vast majority of his contemporaries in Ireland and Britain – and especially so in relation to his denigrators then and now. My chief criticism of Connolly was that he left nothing behind in the way of a revolutionary organisation. He had rather naive illusions in O’Brien, in whose hands he left the ITGWU and the ICA was isolated from the union itself and marginalised as a political force vis-a-vis the reorganised republican forces. Those forces themselves, moreover, were less a republican vanguard than a pan-nationalist front. This pan-nationalist front simply replaced the old Parliamentary Party in much the same way today’s Shinners have replaced the SDLP. The 1921 Treaty was the utterly logical consequence of the subordination of the leftists, including the republican militants, to pan-nationalism. Same problem with the Provos after the hunger strikes, resulting logically in Good Friday, St Andrews, decommissioning, embracing the PSNI/RUC and the policing boards, and attempting to work Stormont (which involves more and more concessions all the time) and the institutions of the neo-colony in the south. So Connolly, facing the British imperialists, got a bit wonky in ‘talking up’ the German alternative? Not a big deal for me. The Germans weren’t the enemy. In relation to who the enemy was, ie where it really counted – the British imperialists and the Irish bourgeoisie – Connolly was spot on. Most of his critics are all over the place on the stuff that really matters. But his somewhat Pollyannish views about German imperialism should be a reminder that we need to stand on his shoulders, not just pick his pockets and rehash what is in them. I agree with you that the revisionists are passe. Every now and then some new revisionist horror pops up – Ann Matthews’ full-on assault on republican women of the early 20th century being an especially crass example – but, generally, we are now in the era of post-revisionism. Matthews just looks eccentric now. I did make this point about the shift in dominance to James while he was working on the book – he told me he got a lot out of my work on the historical revisionists on this blog, but I told him it was very dated now, as I had written it in 1995, and the revisionists had long since become surplus to requirements in terms of the British and Irish elites, and there was a new dominant school of historiography, represented by folks like Diarmiad Ferriter. It’s also interesting to see that today someone as sympathetic to republicanism as Brian Hanley has succeeded as a major Irish historian, something pretty much impossible 30 years ago. Btw, I think it is a bit harsh to say Foster had more interesting stuff to say than Ferriter. Ferriter may write a kind of readers’ digest history, but it has its own insights and is very readable by a mass audience – and it doesn’t look down on ‘the mere Irish’. By contrast, Foster is, and always was, pretentious as hell and a snob who effects a kind of Sebastian Flyte persona, all the while attacking half-English/half-Irish people for identifying as Irish. Foster is a pompous jackass. Give me Ferriter any day. Anyway, good if this review provokes a bit of discussion! Go raibh maith agat, I look forward to reading the book. The wheeling and twisting around the annual commemoration has been well known, talked and written about but I don’t think the entire process has been gathered in one place before and dissected. I agree with you that the current state is no natural extension of the 1916 Rising. I’d go further and say that nor was it a natural extension of the War of Independence but even more, that the War of Independence was no natural extension of the 1916 Rising. The state was created when the ‘victory’ of the anti-colonial struggle was seized in something akin to a coup d’etat, but somewhat more complicated. and in a wink we were back under the halter”. Manus O’Riordan has also written not only outlining Connolly’s support for Germany but vindicating it. I was interested in your dismissal of “the C.D. Greaves school of falsification and works as dreadful as those of Tim Pat Coogan or P. Berresford Ellis” and would be interested in reading tolerable critiques of them — perhaps you can recommend me some?